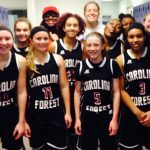 Friday, December 18, 2015 6:00 PM Carolina Forest High School AWAY 33 Summerville High School HOME 39 Game Recap The team fell to Summerville tonight. We had a 6 point lead at half but missed some critical shots and free throws down the stretch. Alexis Tomlin had a double-double with 14 points and 18 rebounds.